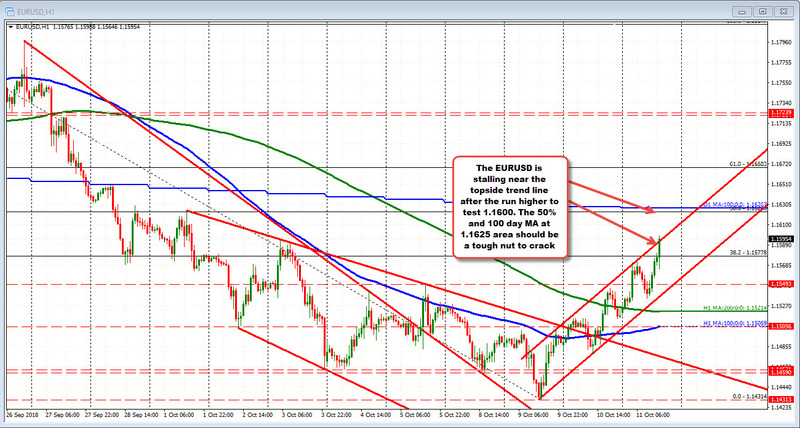 The EURUSD moved to new session highs after the tame CPI. The price moved to a new sessin high of 1.15988 (call it 1.1600) and has backed off a little. Looking at the hourly chart, the run higher did crack above a channel trend line at 1.1592. The price is trading above and below that line now as traders ponder if the pair should make a run toward the 50% (move down from the September 24 high and the key 100 day MA at the 1.1623-26 area. That area should find sellers on a test. On the downside, the 1.15778 will be eyed for close support. The Asian session high was at 1.1572. That area (1.1572-78) should hold if the buyers are to keep firm control. A move below would muddy the bullish waters.